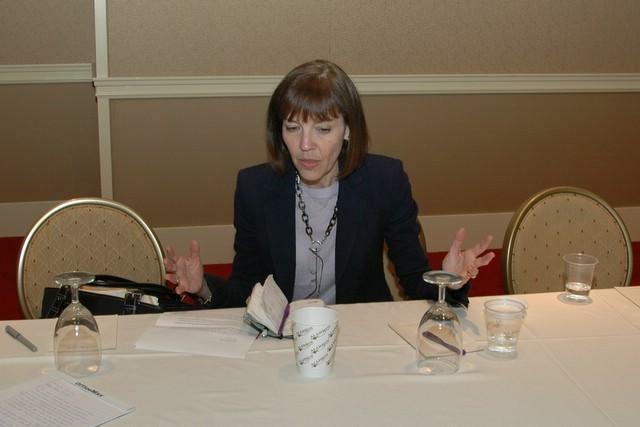 During the Society of Professional Journalists annual convention in Las Vegas I had the opportunity to photograph New York Times reporter Judith Miller for the organization’s magazine, Quill. Miller was there to accept a First Amendment Award from the Society, give a speech and take questions from the conventioneers. 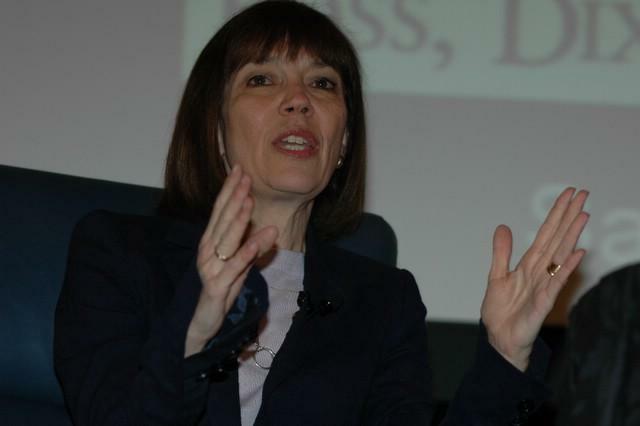 I would love to write more about my experience, including some of my thoughts about the whole Judith Miller situation. Time is limited, though, as I organize and finalize plans for this Friday’s Cincinnati SPJ banquet (wanna come?). But suffice it to say that I think she’s done a wonderful thing for the collective “we” of journalists and, in turn, a great service to the public. Talking with an attorney-friend of mine the other day I referred to her as a martyr for all of us who believe in a strong First Amendment, adding that, for now, she’s my personal Jesus Christ of Journalism. She went to jail for 85 days so I wouldn’t have to. Frankly, no matter your opinion of her reporting leading up to the war (and, believe-you-me, there’s plenty of blame to go around for much of the media covering the build-up), this is not the issue at hand. Not even close. Judy Miller stood hard-and-fast on an unwavering principle of journalism: Promises are promises. The public is better served b y these agreements – no matter how big or small. If anonymous sources cannot be protected I will be one of many journalists and other media professionals who will welcome you to the spun, press-release’d, press-conference’d, sound-bite’d and vanilla version of the world where everything is vetted, cross-checked, approved, plotted, conferred, manipulated, misinformed, calculated and white-washed and made-for-TV into a one-world-view of the, well, everything. Gone will be investigative reports of any substance, insider information on the government and corporations and the underbelly of anything. Without protection in some circumstances who would talk? As a working journalist, past newspaper staff reporter and an active member of the media community, you do not want promises by journalists to be so easily dissolved. Judy Miller, like her or not, stood and stands for something. Something so important and so critical to good, solid and crucial journalism that much of the public does not know, care or u nderstand what exactly has transpired, much less why it’s so important to them. But it is. Sadly, many talking heads – including one surprisingly misguided Harvard professor this week on the radio program “The Al Franken Show” was dastardly wrong and misinformed on the situation and continued to spread more misinformation to a national audience. That stuff has got to stop. I generally expect and receive better from Franken. If you listen to Judy Miller, her explanations seem very plausible, the dots match up and paint a very clear picture. She and her newspaper weren’t doing this for no more reason than to stand up for what’s right and what’s important to the media, and, in return, to the public. Miller’s comments to the SPJ convention Monday were recorded by C-SPAN and could have been obtained before this guy went on the show. The good Harvard prof obviously had not heard her comments from the convention. If you look into Miller’s eyes, hear her talk and let her bear out the minute details of her situation, it makes perfect sense. Not an opportunist, a plotting, manipulative person or journalist. Doing her job? Yes. Competitive? Probably. But you want a competitive press, don’t you? I commend her for actions, her courage and her willingness to ride out this storm and, above all, her outstanding journalism ethics. And those who suggest otherwise, I think, might be not looking at the big and the little picture. It’s high time they did. 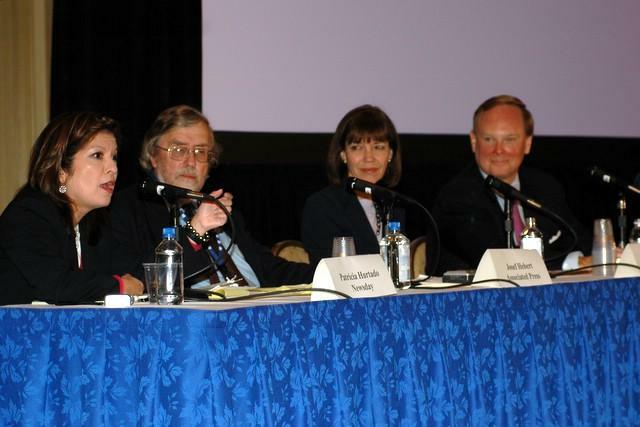 In two photos Judith Miller discusses her situation at the SPJ conventio n before joining a panel of other journalists in similar situations. Patricia Hurtado – a reporter with Newsday – discusses her battle to stay out of a court case she was covering during a panel with the AP’s Josef Hebert and The New York Times’ Judith Miller. Attorneys involved with the case subpoenaed her to testify so she could no longer cover the trial, she said. 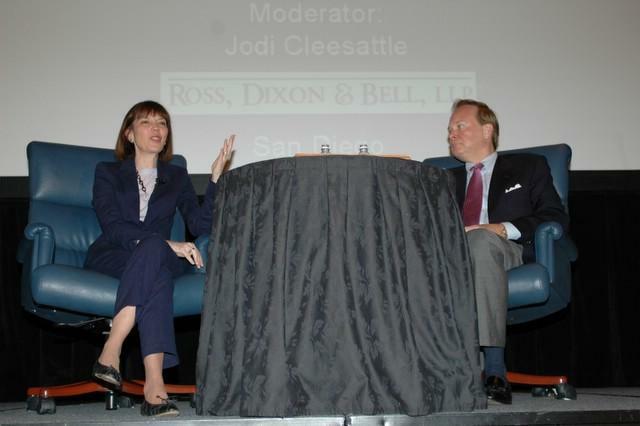 Far right, media law attorney Bruce Sanford who also addressed the audience. 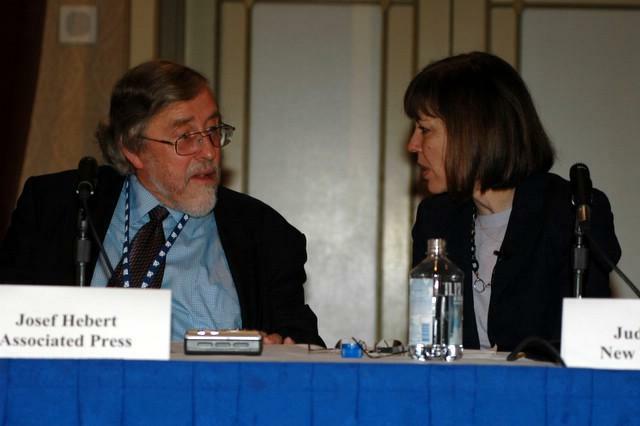 In one photo, Miller talks with Associated Press reporter Josef Hebert, also involved in a subpoena case similar to Miller’s, but with less attention. They were on a panel together at the convention. Miller holds hands across the table with an audience member at the SPJ convention who heard her speak. A crowd rushes the stage after Miller’s panel to get one-on-one time. Miller addresses the crowd. After leaving the conference hall, Miller spends time with Cleveland-based freelance writer Wendy Hoke to be interviewed for Quill, SPJ’s magazine (two photos). What a whirlwind, Joe! Still trying to make sense of it all for my story. Thanks for partnering with me on this assignment. Love the blog! NICE post, Joe. FUN to see those photos – had to be worth the wait, huh? Will add your blog to my roll. Have a good week. I’m still not convinced, Joe. Right now I feel as though Judith Miller is someone with an inflated sense of self-importance than a defender of the First Amendment. And more than anything, this whole debacle is making our profession look worse.